Imagine this scenario: for whatever reason, you are bugging out, and have to travel through an urban or suburban area, or even along an interstate highway. It's hot. Dang hot. And you need water. There's no streams or lakes or ponds nearby. Nothing is open, and there's no power to operate a soda machine, even if there was one around. You've got a container in your bug-out bag, but you need a source of clean water. 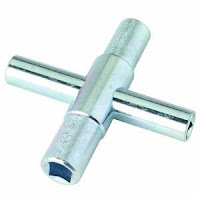 If there are commercial buildings, there is water available, but without a special tool, you can't get it! What are you talking about, Backwoods? Ever seen these special faucets on the side of a convenience store or gas station, or other commercial building? 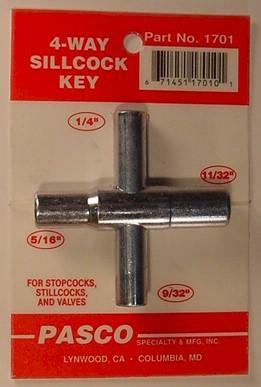 It's known as a keyed sillcock hydrant. They are everywhere in the suburban and urban environment. They're used by building maintenance people for connecting water hoses for washing sidewalks, etc. It's a good bet that almost all have good water in them 24/7/365, whether the business is open or not. Even with the power down, there's probably going to be some pressure left, which allows you to get some hydration. Yeah, keyed sillcock hydrants are everywhere. Without a sillcock key, it's going to be hard to get the water. Yeah, you could probably use the pliers on a Leatherman or Gerber tool, but why mess with all that? Just put one of these babies in your bugout bag. And for $6.42 on Amazon.com, why not? Throw this little 3-ounce key in your bugout bag, and wherever you see a commercial building, most likely you can get some water, in an emergency situation and businesses are closed. I've got one of these in every bugout bag in every vehicle in my family. They may even be available from your local building supply store; I haven't checked. Just a little survival tip from Ol' Backwoods. UPDATE: Archy, a reader from Free Republic, said you can go into any plumbing supply store and ask for a "4-way". From working building maintenance for years, many large, multi-story office buildings have auxiliary water tanks on the roofs to provide adequate water pressure for the whole building. So, you are absolutely right that many of those buildings will have water AND pressure even in the absence of city water, at least for a time. My 72-Hr Pack or "Bug-Out Bag"
Very good idea. From working building maintenance for years, many large, multi-story office buildings have auxilary water tanks on the roofs to provide adequate water pressure for the whole building. So you are absolutely right that many of those buildings will have water AND pressure even in the absence of city water, at least for a time. Good post! Thanks, Wolf! Your comment has been incorporated as an update. And welcome, fellow Survival Podcast listeners! I've been with Jack since Episode 56. I have never truly dealt with main plumbing problems after a recommendation from the buddy I went with David and the crew to do tunneling work and replacing our aged surefire plumbing. This option did a great job and was extremely useful and communicative over the process. I'd suggest united states plumbing in order to anybody who requirements plumbing function and wants the task done correctly as well as fast. Highly recommended! Great post with useful information!